Cold Air: Fairly perverted: Ontario's "Fair Hydro Plan"
On March 2nd the Premier of Ontario introduced the "extend and pretend" plan to lower electricity rates for voters prior to the next election; on May 11th the government introduced its "Fair Hydro Act" bill shortly after the opposition Progressive Conservative's released an allegedly leaked cabinet document. The general content revealed contains some interesting details confirming what was suspected: the Premier's plan is cynical and irresponsible. the Premier promised a 25% cut in rates. This post will use some of the new material to emphasize why rates are high, what extending the payment period implies, and how the government intends on keeping the costs of the program off of the Province's balance sheet. Now that we know the commodity portion of the bill is being reduced 25%, we can be more definitive about what is being subsidized, by whom, and the fairness of the policy. moving costs for Rural/Remote Settlement and the Electricity Support program from ratepayers to taxpayers should reduce bills another 0.3+ cents/kWh. Add all that up and bills in the second half of 2017 are reduced by nearly 25% from 2016, and more than 25% if inflation is accounted for. Mostly delayed - or shifted. Some costs are shifted to taxpayers. While the government publicly estimates these to cost the province $2.5 billion over the next 3 years, they are social programs and I share the opinion the costs do not belong on ratepayers bills. Recent investments in electricity infrastructure will create benefits for years to come. For example, the majority of the province's electricity generators have 20-year contracts. Many of these generators will be able to operate past their contract term, meaning that generating assets are expected to have ongoing useful life and will benefit future ratepayers by reducing the need to finance the development of new generating assets. To relieve the current burden on ratepayers and share costs more fairly, a portion of the GA would be refinanced. Refinancing the GA would provide significant and immediate rate relief by spreading the cost of electricity investments over time. Initial analysis indicates that the accumulated debt will not exceed $28 billion, including interest. In a wonderful coincidence, $27.7 billion in 2017 dollars is exactly equivalent to $19.4 billion in 1998 dollars. 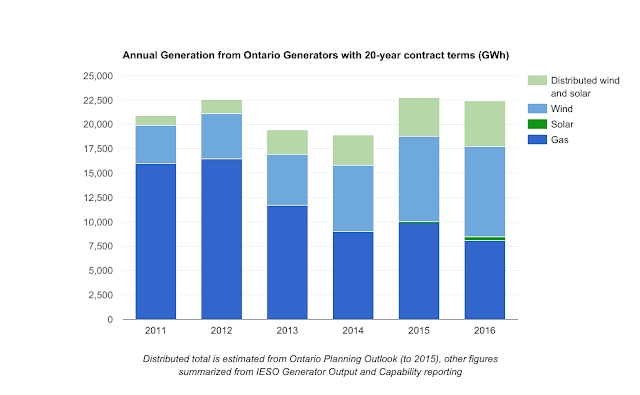 Once again I see the liabilities from the wind and solar experimenting of the McGuinty-Wynne-Schroeder-Suzuki-Tritten-Scheer era in Ontario equaling the entire liability of building the entire public system: today's "stranded liability" equates to that officially deemed to exist when Ontario Hydro was broken up in 1998. Strangely, the government finds its "spreading" approach "fair" for one set of consumers, but not others. While Regulated Price Plan (RPP) consumers will see the discount today, and higher costs starting in about a decade, the bulk of consumption is not by RPP consumers - and that group is unaffected by the Fair Hydro Plan. 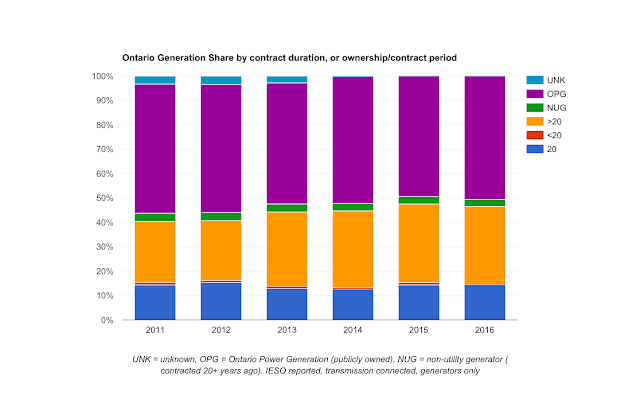 These percentages are estimates impacted by a couple of things: as most solar in Ontario is embedded on distribution networks it is not captured in these percentages, but a number of 20 year contracts were written for continuing operation of existing hydroelectric sites which are included. Electricity rates have risen for two key reasons. First, decades of under-investment in the electricity system resulted in the need to invest more than $50 billion in generation, transmission and distribution assets to ensure the system is clean and reliable. Second, the decision to eliminate Ontario’s use of coal and produce clean, renewable power has created additional costs. That's fairly incomplete - and honestly irrelevant in terms of the proposed reduction in costs. There was no commitment to value, system reliability, or emissions. The replacements for coal-fired power had already been contracted, and many had already entered commercial operation. The only commitments of the Green Energy Act were to contracting "renewable" generators and spending on conservation - a fairly wasteful act during a period of abundant supply. From 2011-2016 I estimate the annual spending on generators with 20-year contracts, and negawatts, surged by about the $2.5 billion the government now says they'll knock off the annual receipts from regulated price plan consumers. Discounting voters' bills by 25% to compensate for the additional costs added by Green-Energy-Act induced conservation and sporadic generator contracting, only to displace generation from the also recently contracted natural gas-fired powered plants, isn't the only thing being pitched as fair. The last time a government created - or announced - a liability this large in the sector a debt retirement charge of $7 per megawatt-hour (MWh), or 0.7 cents/kWh, was created and applied to all consumers in the province. While this charge ended with 2015 for voters, and other RPP class consumers, it still applies to non-RPP consumers. Regulated Price Plan consumers use about 43% of the electricity annually servicing Ontario - the other 57% still pay the debt retirement charge. To be clear, consumers still paying for the last deemed stranded debt/liability are not going to get relief from current charges deemed to be so onerous on voters that another liability must be created for another generation. To be fair, they are also not currently targeted for paying back the next stranded debt. Under Premier Wynne's fairness, according to the leaked document, the debt created by avoiding the costs of the Green Energy Act will be paid back by only the voters/RPP class. By 2028 the credit is planned to be a burden. According to the leaked cabinet document, an additional charge of approximately 2.8 cents/kWh on voter class (RPP) bills will be necessary, for two decades, to pay off this debt. In fairness, I'm skeptical. A fourfold increase in the voting/RPP class' debt retirement charge is planned for the decades from 2028-2048 at a time the voting/RPP class is exempt from paying off the previous debt retirement charge. Nobody should be foolish enough to believe this will occur - voters will again tell a Premier to abuse the business consumer instead. Speaking of business... where is the money to come from? 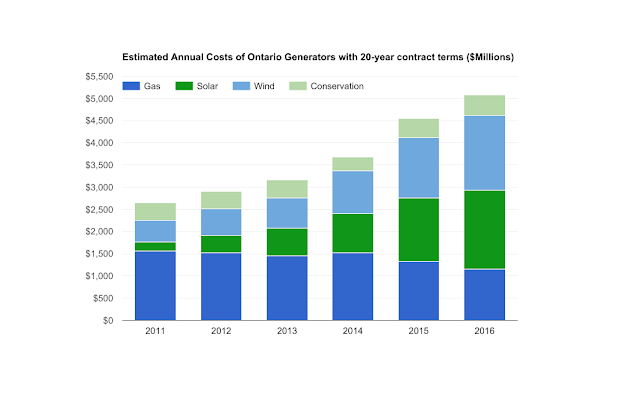 The billions of dollars in extra debt needed to lower rates after 2017 will not appear on the government’s books but will instead be raised by Ontario Power Generation, the Crown corporation responsible for generating about half the province’s electricity. While the province and OPG will provide some of the money for the plan, most of it will be raised by selling debt to private investors, said Jeff Lyash, OPG’s chief executive. With OPG, the OFA continued to manage the investment activities of OPG’s Used Fuel Segregated Fund and the Decommissioning Segregated Fund established under the Ontario Nuclear Funds Agreement (ONFA). As at March 31, 2016, the combined market value of the funds was $17.9 billion compared to $18.1 billion at March 31, 2015 and $4.9 billion when the funds were formally established in 2003. There are currently 26 external investment managers retained to invest ONFA funds in bonds, equities, and real assets. For the 12 months ending March 31, 2016, the funds’ rate of return was -1.0 per cent, ahead of the market benchmark of -1.57 per cent. Since inception, the funds have returned 7.38 per cent annualized, outperforming the long-term target annualized rate of return of 5.14 per cent. This target is a real rate of return of 3.25 per cent annually, calculated by adding 3.25 to the rate of change in the Ontario Consumer Price Index. The posted Fair Hydro Act does stipulate "the assets and liabilities of that financing entity shall not form part of the assets and liabilities of Ontario Power Generation Inc. or any of its other subsidiaries," but I am skeptical. Regulated rate consumers, first adjustments7 (1) Despite any order under subsection 78 (3.1) of the Ontario Energy Board Act, 1998 and despite section 79.16 of that Act, the electricity rates payable by regulated rate consumers for the period beginning on July 1, 2017 and ending on April 30, 2018 are the rates, as determined by the Board, that would result in a hypothetical regulated rate consumer who meets the prescribed criteria being charged an invoice amount that is 25 per cent less than the invoice amount that would have been charged to that consumer under the comparison rates described in subsection (2). Comparison rates(2) The comparison rates are the rates that would have been effective May 1, 2017 if they had been determined by the Board solely using the method prescribed by the regulations made under clause 79.16 (1) (b) of the Ontario Energy Board Act, 1998, without taking into account any forecasted impact of any other provisions of this Act.